A few months back I came across a local wood shop selling live edge wood slabs. I’ve always admired the raw, natural look and beauty of slabs so decided to go check them out in person one day at lunch. It measures roughly 11′ long, 3′ at the narrow end to 4′ with a gradual taper. It is stickin’ huge! More than a tad scary how much work is still needed – I wanted to put my own sweat and tears into this thing. Oh, did I mention this is my first slab table, ever!?! The slab is a bit un-even with some large to small cracks throughout. 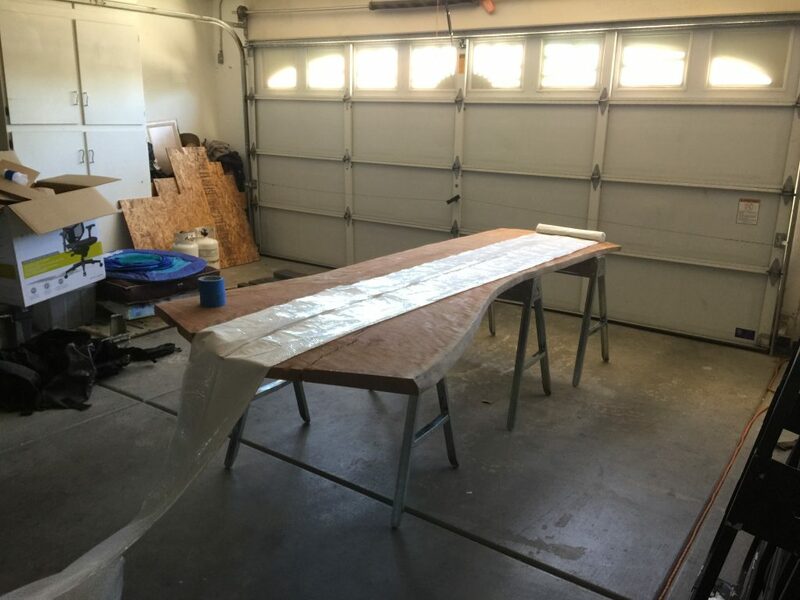 The shop didn’t have a planer wide enough to stick this thing thru, so they used a floor sander (not kidding) to get it somewhat sanded and smoothed on one side that will be the top side. They also knocked down the bottom side a bit but left it pretty rough. One thing’s for sure, I’m going to get a decent amount of practice making and fitting Butterfly joints and inlays. There are a number of cracks throughout the slab, one large enough to completely see through. After the Buttefly joints on the bottom are done I’ll be adding a few on the top along with adding epoxy on the larger cracks. Delivered and in the garage, note the side that is facing up is actually the bottom. It’s still in very rough shape; un-even and very gouged. 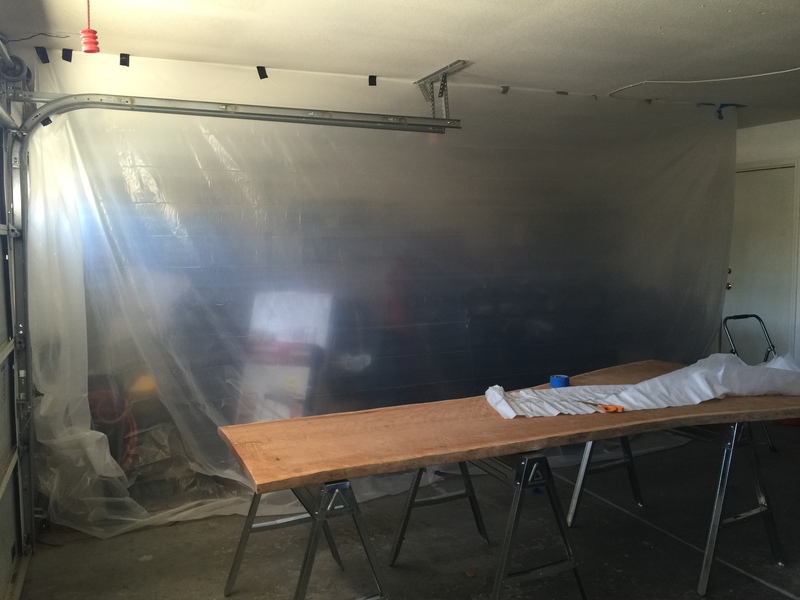 My first step was to put up some plastic in the garage (aka, my Dexter kill room) to keep the saw dust somewhat contained. I just wanted to smooth out the gouges on the bottom a bit. The other side (which will be the top side) has an amazing looking ‘flame’ pattern. Can’t wait to flip it back over and take some pictures for everyone. 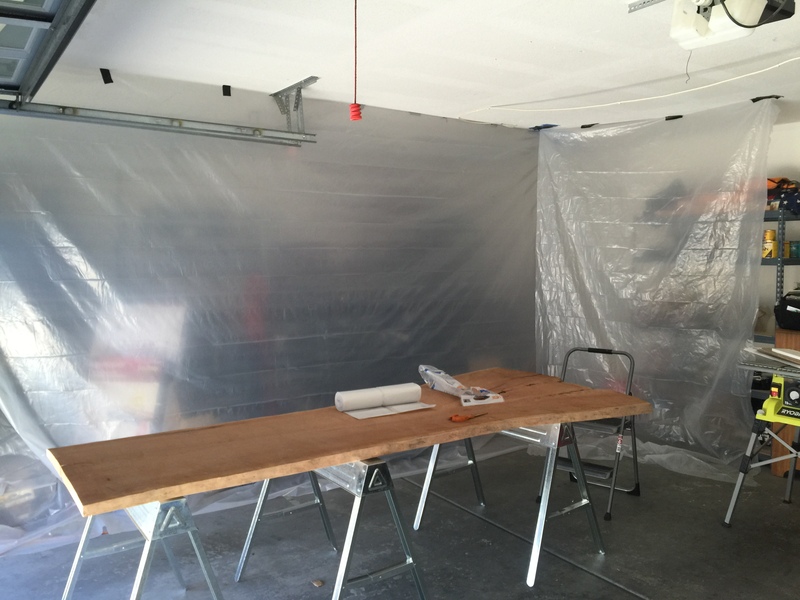 Eventually got plastic hung up completely around the table. Unfortunately the tape doesn’t hold well (plastic is fairly heavy) in this Vegas heat, so it eventually fell down – ha. Luckily I got the majority of the bottom smoothed out a bit – just wanted to knock down the roughness. 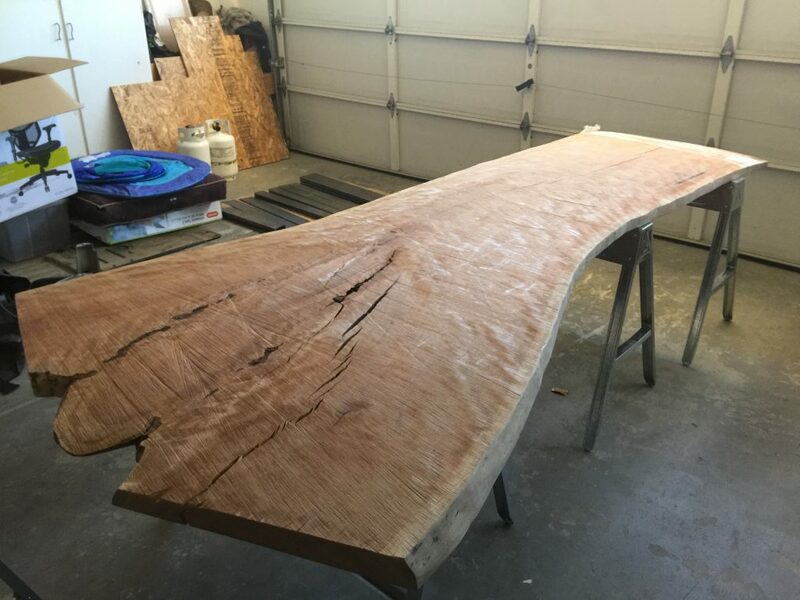 This entry was posted in woodworking and tagged part 1, slab table on August 18, 2016 by Greg.